So you've found a lens and you don't know what camera it fits? Scroll down this set of photos until you find the one that it looks like. I don't have everything here, but I have most of the more common ones for manual-focus, focal plane shutter 35mm SLRs. This question comes up often, so I thought I'd just add this note on MF/AF lens mounts before you scroll down through the photos. - CANON: The FD mount fits all manual focus Canons from 1970 forward; the EF mount fits all EOS series autofocus models. These mounts are NOT interchangeable; adapters are available but I would avoid them. Canon EOS film and digital SLRs can, on the other hand, accept almost anything BUT a Canon FD lens with adapters: Nikon, OM, Pentax M42 Screw, and Leica SLR lenses can all be adapted. 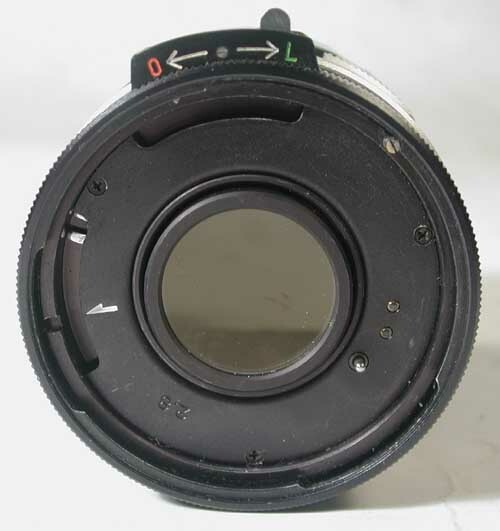 - MINOLTA: The Minolta lens mount never changed, until the Maxxum autofocus series came out. Autofocus Minoltas cannot accept manual focus lenses. - NIKON: The Nikon bayonet did not change when AF was introduced. 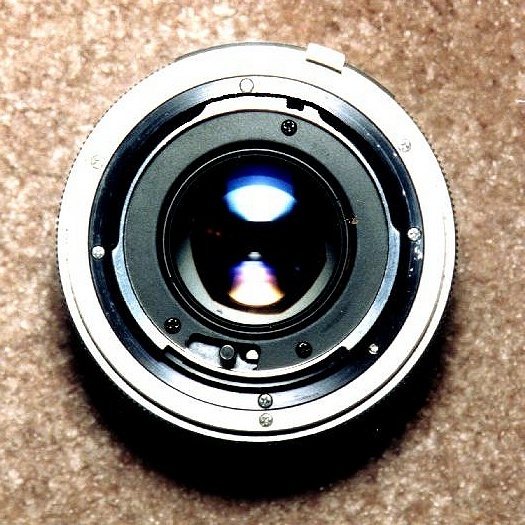 Lenses can be mounted, but due to electronics, some AF models may not work properly with MF lenses. 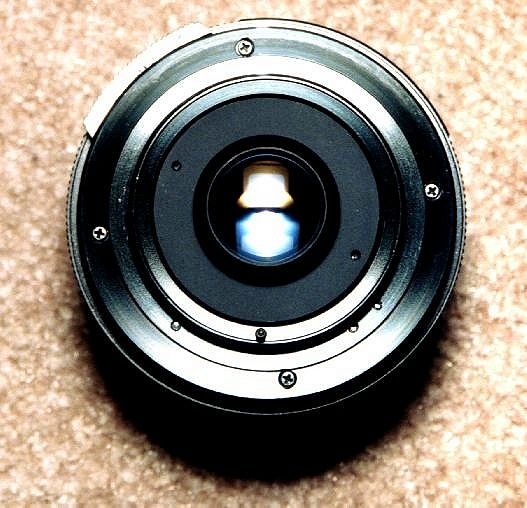 - OLYMPUS: The OM mount is the most stable of any MF lens mount, there were never ANY changes in the manual focus series. There are 2 Olympus autofocus systems: the OM77 could accept OM lenses, but AF lenses did not work properly on manual focus OM bodies; the Olympus digital SLRs have a totally new, incompatible mount. Although no manual focus lenses can be used directly, the Olympus DSLRs are the most versatile of all in terms of accepting older lenses via adapters. There are adapters for OM, Nikon, Pentax (both screw mount AND bayonet), Leica R and Minolta MD lenses to fit Olympus DSLR cameras. - PENTAX: ALL Pentax K-mount lenses will work on ALL Pentax bayonet bodies, including autofocus and digital. For "Program" operation with some models, you will need a Series "A" or later lens. A note of caution, though: there was a KA mount for Pentax, and also a KR mount for Ricoh program cameras. Both of these have the same K bayonet, but the location of electrical contacts is different between them so that they are not cross-compatible for program functions. ALSO, AND MORE IMPORTANT, it is possible for some KR lenses to jam on some models of Pentax cameras, and be impossible to remove or cause damage to the camera or lens. 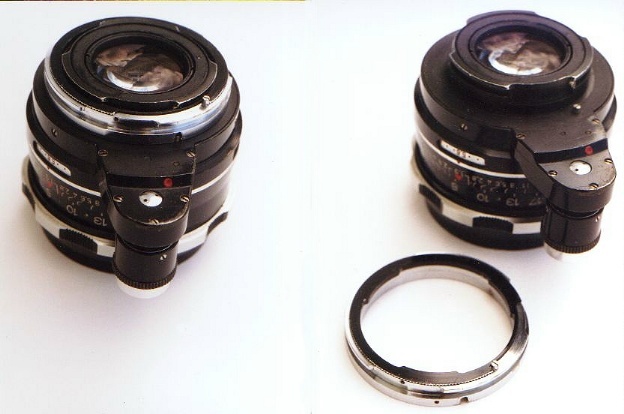 In particular, it is not wise to attempt to mount a KR lens in an Autofocus or Digital model of Pentax. There may be other incompatibilities as well, so proceed with caution whenever cross-mounting Pentax and Ricoh lenses and bodies. The lenses are shown right-side-up as mounted on the camera (but there's a special note on the Canon). This is a late Canon FD mount, "bayonet" style. The "breech" style Canon FD mount looks similar, but you need to hold your lens so that the top is toward the red dot in the photo for the levers to be in the same position. These fit all manual-focus Canons from about 1970. 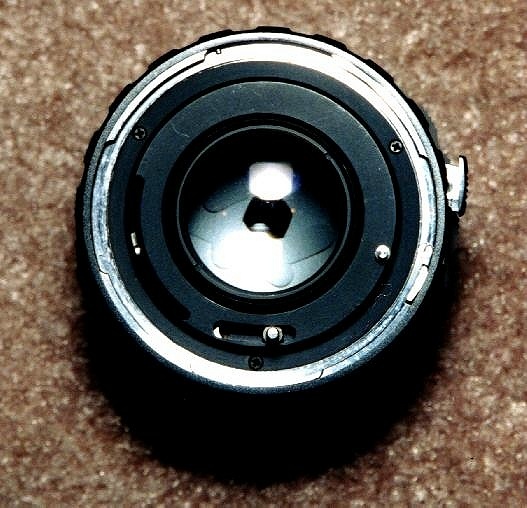 I'm going in alphabetical order here: This is an Exakta mount lens. Most have the protruding arm at the side, but preset lenses and late ones for the RTL1000 don't have the arm. Topcon RE lenses use the same bayonet, without the arm, and have linkage just outboard of the bayonet for the aperture control and the auto-diaphragm. Many thanks to Geoff Steed for identifying this adapter ring: it's one of two "System Rings" that were produced by the West German Exakta organization in the early 70s for the Exakta Twin TL. The Twin TL was made by Petri in Japan, and used the lens mount that had been developed for the West German Exakta Real in the 1960s. The Real and Twin TL came from Exakta Kamerawerk AG, a West Berlin rival of Ihagee of Dresden (in East Germany) who made the "real" Exaktas (confused yet?). None of Exakta Kamerawerk's efforts met with much success, and they are uncommon-to-rare collector's items today. At any rate, this adapter ring allows a Real or Twin TL to accept all standard Exakta mount lenses. 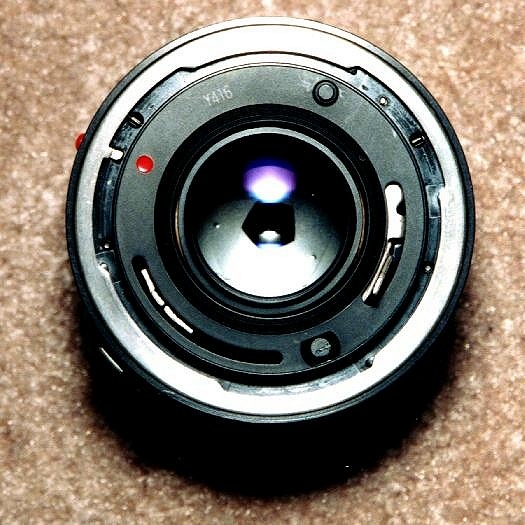 The second "System Ring" allowed those same cameras to accept M42 screw mount lenses. Unfortunately, I've never had a camera that fit this adapter ring. This is the Minolta MC/MD mount. It fits any manual focus Minolta SLR. 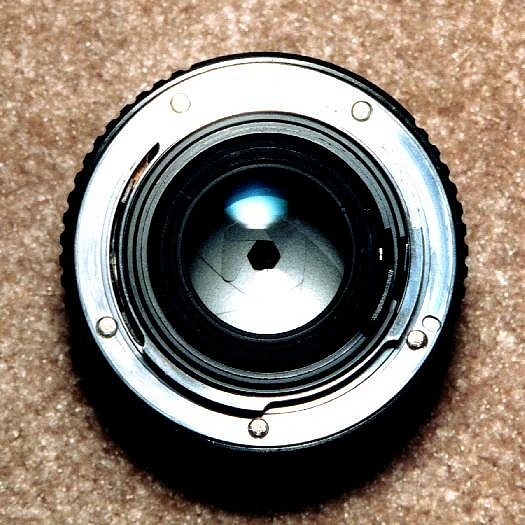 Like the Konica, Minolta lenses latch with a notch in the top bayonet lug; but note that the notch is near the end of the lug, not nearly centered as in the Konica. 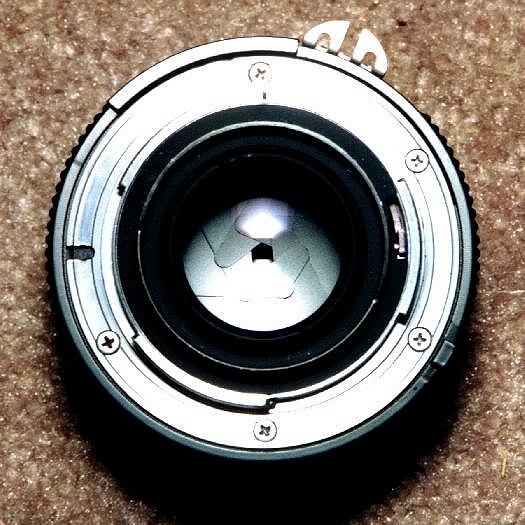 The bump on the aperture ring at the top is the coupler for the indexing ring on the body -- similar to the Nikon AI system (but Minolta had it first). This is the Miranda bayonet. 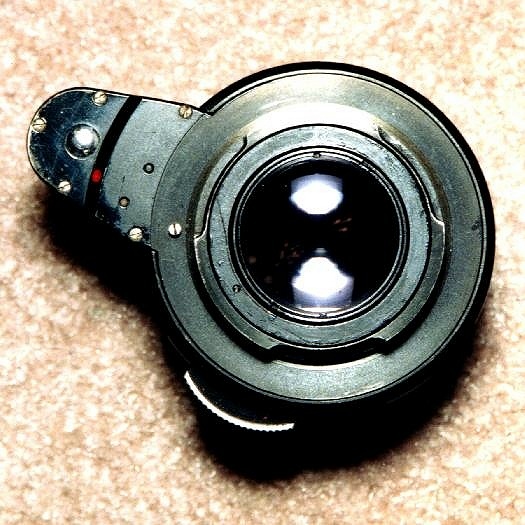 Though all Mirandas used the same bayonet, there were variations in the registering pins on the back of the lens: earlier versions (up to about 1973 or so) lacked the pins which were used for open-aperture metering in later cameras; lenses for the Automex, Sensorex and Sensorex II models have a moving arm on the side to couple the aperture ring to the camera body. 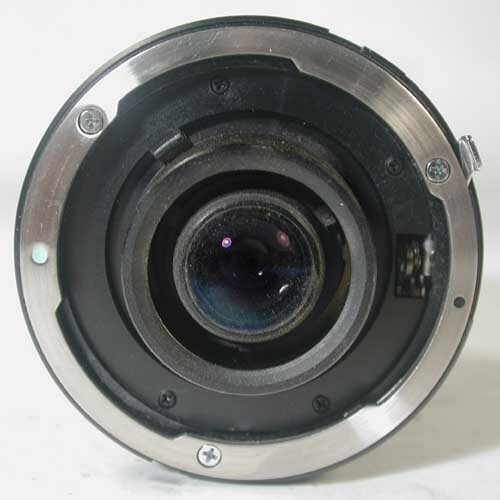 Miranda camera bodies also have a 44mm screw-thread mount, inside the bayonet, for special accessories and T-mounts; but the prime lenses are most commonly found in bayonet mount. Before the introduction of the Miranda bayonet mount, from about 1955-1960, Miranda cameras used a 44mm thread mount as shown here. 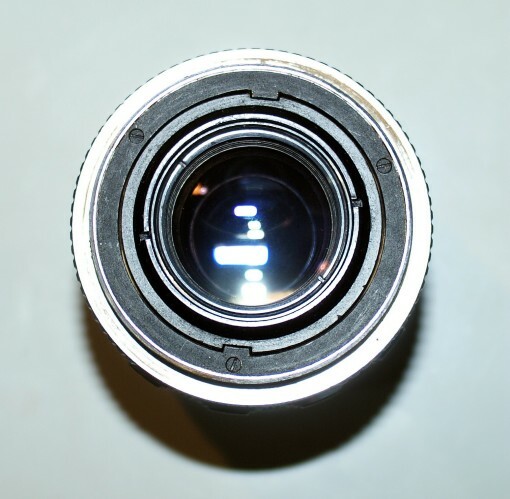 The M44 screw thread was kept as part of the bayonet mount design, so that these lenses could still be used on later Miranda cameras. 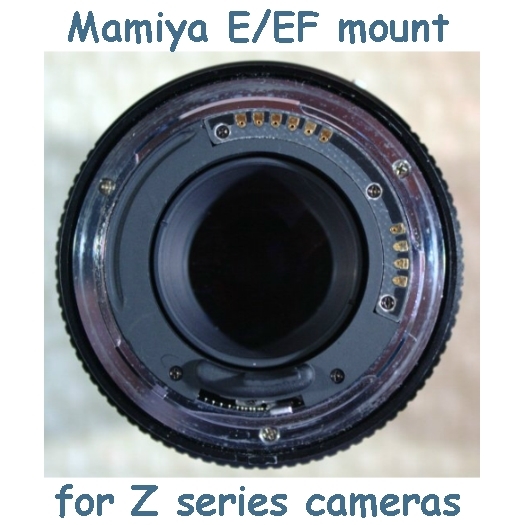 Some new lenses continued to be offered in the M44 screw mount as late as 1967, and it also remained the standard mount for bellows, T mounts, and other accessories that did not require aperture coupling. Many thanks to Menno van der Meer of Spain, both for this photograph of the M44 mount and for corrections to the description. This is a Nikon AI mount. 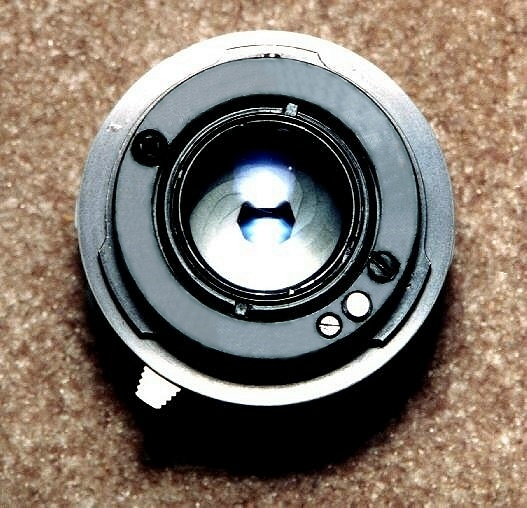 Non-AI is similar, but without the 'stepped' surface at the rear of the aperture ring. This lens can be used on any Nikon SLR, including the new AF models (well, maybe not ALL: Nikon has apparently taken to using electronics to communicate between the lens and the body in some of the latest models, rendering perfectly good older lenses useless); Non-AI lenses must be converted for use on newer (post-1977) cameras, and some cameras can be damaged by attempted use of non-AI lenses. Current Nikon lenses do not have the 'fork' protruding at the top; absence of the fork makes these incompatible with pre-1977 Nikons and Nikkormats. Click on the Photo for an explanation of the differences between AIS, AI and Non-AI Nikon lens mounts. This is the Olympus OM mount. There have never been any variations of this mount; every OM lens fits every OM camera ever made. Note the lens release and stop-down buttons opposite each other, an easy identifying feature of the OM mount. The Pentax K mount was introduced about 1975 and fits all non-screw-mount Pentaxes as well as many Ricoh, Chinon and Cosina cameras. 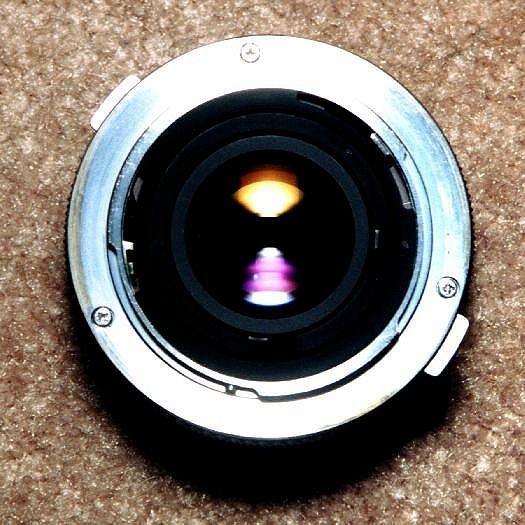 The notch at the lower corner for the lens release lock helps identify this lens (Nikon lenses have a similar notch, but on the opposite side and centered rather than toward the lower corner). Current Pentax AF cameras use the same mount. 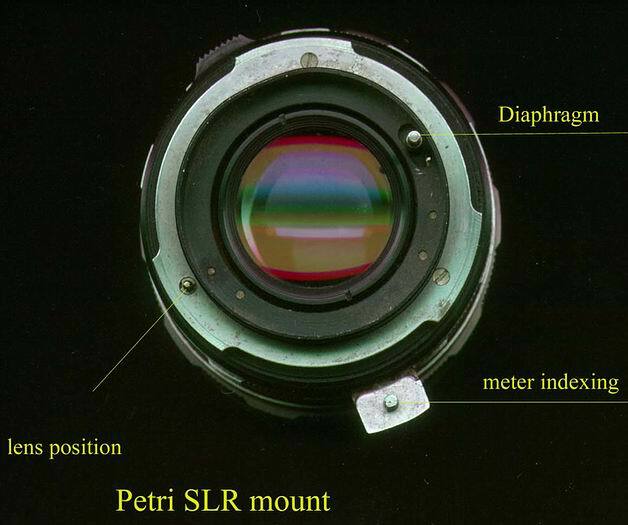 This is the Petri lens mount. Petri used this through most of their production, changing toward the end to the M42 mount to take advantage of the availability of third-party lenses in M42 (I don't know if you'll find any third party lenses in the Petri mount). The original Petri breech-lock is a good, wear-proof mount, similar to the Praktina design just below (but not interchangeable with it). Many thanks to Matthew Currie for this photo, complete with explanatory notes. Here's another oldie: this is the Praktina FX bayonet from the late 1950s. The later IIa model used the same mount but with slightly modified diaphragm operation. No other camera has used the Praktina mount; the Pentacon Six/Praktisix/Exakta 66/Kiev 60 mount is essentially a scaled-up clone of this design. 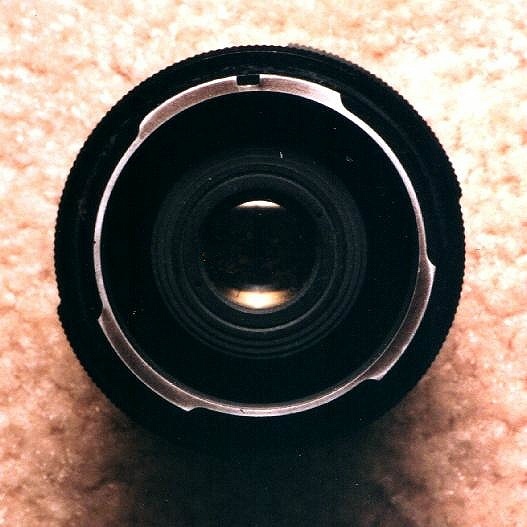 This is the rear end of a T4 mount lens. The later TX mount is nearly identical in appearance, but is marked "TX" on the back surface. This is the back end of a Tamron Adaptall lens without its mount. Similarly to the T4 and TX, the Adaptall system evolved as the cameras did; this is an Adaptall-2, but the differences are subtle. This system appears only on Tamron brand lenses. For the moment, this is my only example of a leaf-shutter lens mount. 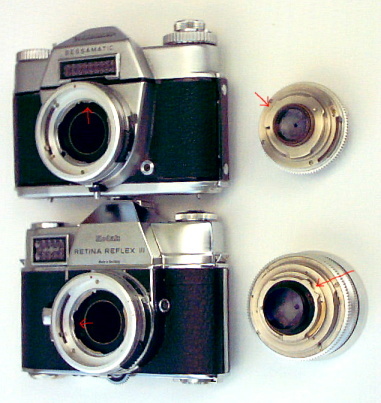 The Retina Reflex and Voigtlander Bessamatic/Ultramatic mounts are identical except for the little tabs and cutouts shown at the red arrows. It's very easy to machine either the body or lens mounting flange to make them fully interchangeable. Here's how. There's not really any reason to include the leaf-shutter lens mounts here, now that I think of it: as far as I know there were no aftermarket lenses made for any of them other than a couple of Retina/Voigtlander teleconverters.... so if your lens says "Retina", or "Kowa", or "Topcon UV", that's the camera that it fits.